“As a child, I witnessed the weekly ritual of my mother dressing for an evening of social dancing (also known as Detroit Bop) with my uncles and her close friends. Part of the dancing culture in many urban cities is the opulent dress code, which is quite different from Sunday church attire. Often times, the woman’s dress would match her wig and dance partner’s suit. On special occasions, couples color coordinated their outfits with their cars. Social dancing was a major pillar in my community and greatly influenced my work. As an aspiring fashion designer throughout high school, I gained inspiration from my mother and the black models in Ebony Fashion Fair who were clad in haute couture. For Stay Fly, I drew upon my mother’s style and the 90’s aesthetic of my youth. Part of “being seen” was adorning oneself with the luxury brands of the time. A notable motif in my work is the eye-catching, patterned Coogi sweater, popularized in the 90’s by The Notorious B.I.G. 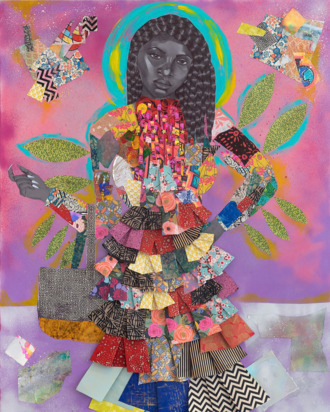 The collages in the exhibition are equally as dense, each subject wearing lavish and flamboyant attire. 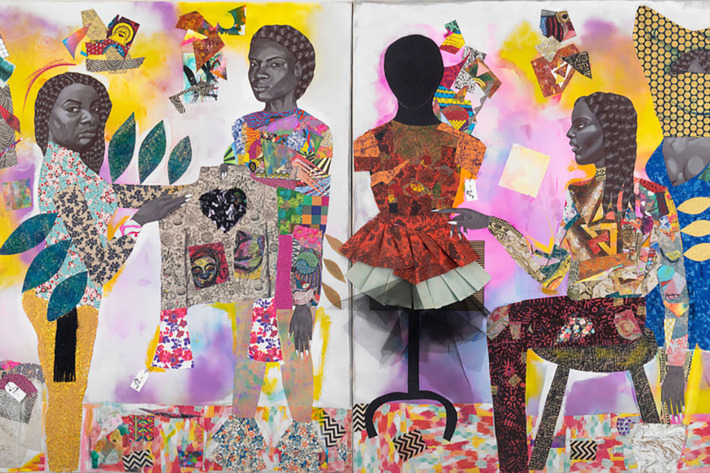 My paintings are also inspired by the intensity and rhythm of work by AfriCOBRA, or African Commune of Bad Relevant Artists, an African-American artists’ collective formed in Chicago in 1968. Throughout the exhibition are accessories and clothing borrowed from the personal collection of my friend Desirée Venn Frederic, an entrepreneur and social activist based in DC. Most of the items are popular luxury brands pointedly mixed with knock-off bags I acquired from Canal Street in NYC. Each piece was carefully curated and reflects a memory from youth or a garment my mother would wear. Jamea Richmond-Edwards was born and raised in Detroit, MI. She graduated with a Bachelor of Art degree from Jackson State University in 2004, where she studied painting and drawing. Jamea went on to earn an MFA from Howard University in 2012. 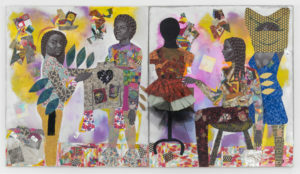 Throughout 2019, her work will be on view in the Rubell Museum in Miami. 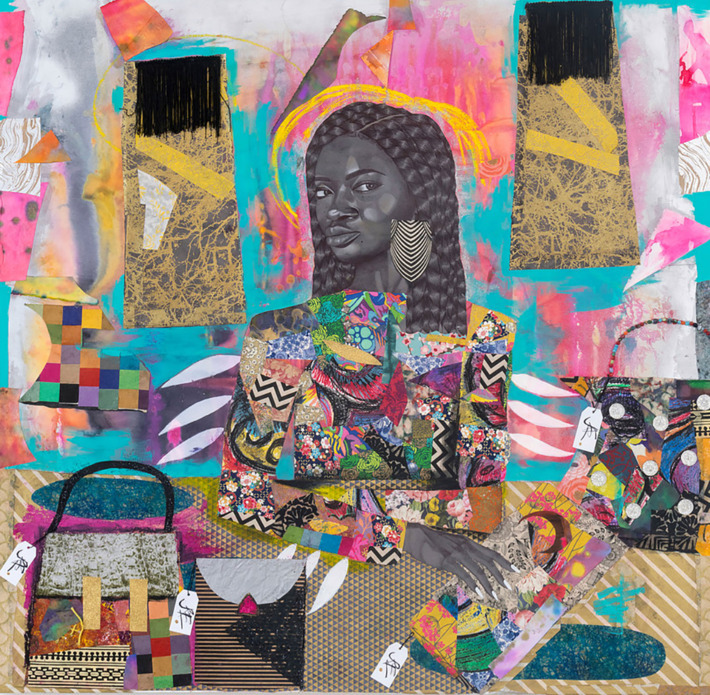 Jamea has exhibited her artwork nationally and internationally including the Delaware Art Museum, California African American Museum, Charles Wright Museum in Detroit MI and her current representation Kravets Wehby Gallery. 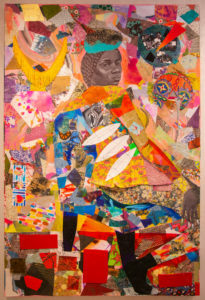 Her work has been highlighted in Art News, Departures and NY Mag’s The Cut. She resides in MD with her husband and three sons.